Many of my recycled bag projects involve taking traditional yarn patterns and converting them into items made from recycled materials. This little cluster stitch bag is just such a project. One of my on-line friends Helen created this adorable gift bag pattern using a medium weight yarn. With Helen’s permission, I used her pattern for the basis of making this cute little bag project using recycled plastic bags. I then used some scrap yarn to make the top trim and handles to finish off this recycled bag project. Here is a closeup photo of the handles that I crocheted onto the bag. This little plarn bag would make a great gift bag or purse. By adding a ribbon or bow to the bag, you create a re-usable gift bag that can be used over and over. The pattern works up very quickly and because of the pretty stitch pattern, I think it makes an adorable purse too. Enjoy the free recycled crafting pattern below and happy crocheting to all! What better way to have a green Christmas than to handcraft your own Christmas gift bags from recycled materials. Maybe you need a small bag for a gift card. 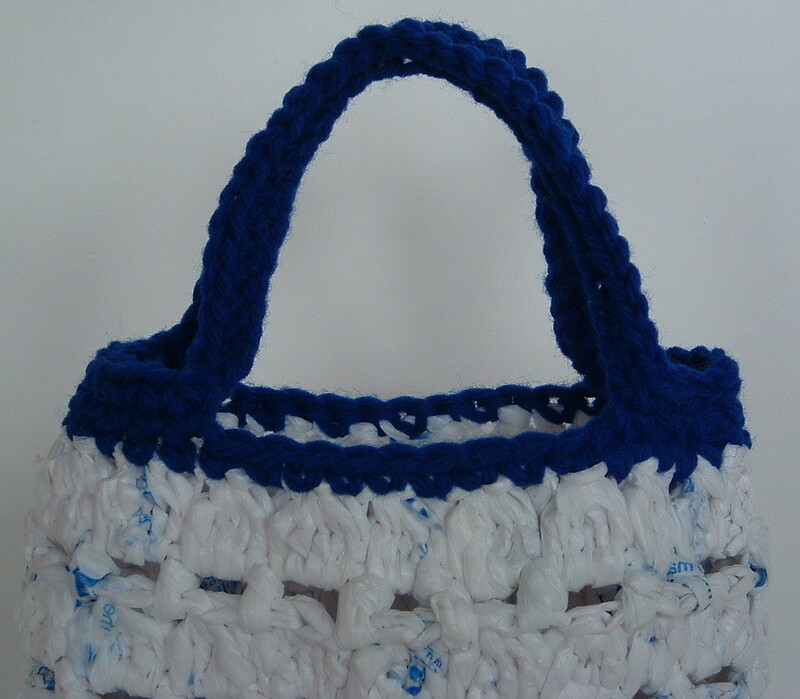 Well check out this cute little gift bag crocheted from recycled plastic bags. Crafting with recycled plastic bags is also known as plarn. If you need to know how to make plarn, check out this picture tutorial. You can crochet this gift bag using plarn with this free pattern . Maybe you need a larger gift bag. If so, here is a Christmas tote bag crocheted from recycled plastic grocery bags. This roomy tote bag would make a wonderful gift bag for a book or other flat items. Here is the link to the free crochet pattern for this tote bag.